Sharp-thinking Kibera boy, who started charity organization from his small savings to combat extreme poverty and sufferings in African slums, starting with his own. Kennedy Odede had the choice of walking away from his poverty-stricken community. But instead, he decided to stay put and do something about their sufferings. Growing up in Kibera, arguably Africa’s largest slum, where a dollar would easily manage a day’s budget, Odede saw the terrifying face of poverty and hunger. He remembers escaping an angry mob in Toi market that bayed for his blood when he was 10. He had been accused of stealing mango from a fruit vendor. “It was unintended but out of urge to kill the pangs of hunger, I was tempted. I tried to explain, but the mob couldn’t hear any of it,” he recalls. He was lucky to escape. A resident in this slum, which according to an online platform Kibera.co.uk, has a population of over 250,000 – most of whom are housed in small mud-walled shacks costing Ksh700 a month and with only 20 per cent accessed to electricity and about 50 of them sharing one latrine, Odede had to equip himself with various survival skills at a tender age. Here, he says, one would sweat to the feet to make it in life, a thing that trained his focus on bringing change to the community. By 12, he’d mastered accounting skills, which enabled him record financial data for his mother, Jane, who was secretary of a local women group. Despite the struggles they went through to put food on the table, life was still unbearable, prompting him to go out to look for employment in the city’s suburbs. “It was the most viable option. See, most youths had to be committed in some paying job. It was very easy being mistaken for a thief and paying the price if you maintained the latest fashion without an income,” he says. Luckily, he was fortunate to get a job at a construction site, where he would save part of the daily US$1 wages and implement an idea that struck his mind months later. At 16 years old, Odede founded SHOFCO (Shinning Hope for Communities) club, a formation of both football and theatre, to educate communities on gender violence, health and girls’ education. The grassroots organization would organize events and entertain audiences while spreading motivational messages. The idea worked. More youths registered and the formation soon attracted local and international goodwill. In 2007, Odede received a call that flung open the gates of opportunities. He got a full scholarship to pursue Bachelors degree at Wesleyan College in the US. Back home, he met Jesica Posner, an international student who had come to Kenya for a semester in theatre studies. With a shared ideology and vision, the two easily blend, dated and later got married. They have since both become directors of SHOFCO. The organization focuses on providing tuition-free education to young girls whilst offering certain enabling social needs to combat gender inequality and extreme poverty in the four slums where it currently operates. It all starts with a school-constructed by the organization- which provides not only education to the underprivileged children, but also healthcare (from their clinic), food and other essential psychosocial services. “We lay more focus on girls in the belief that educating this gender in such social settings means they’ll invest more on their families, be independent hence free from diseases such as HIV and be self-directed,” Odede explains. From the school, are also linked other holistic social services. The organization identifies and offers essential services such as clean water, free healthcare, financial empowerment programs and sanitation education (by providing toilet facilities) to the communities. It also empowers the community by providing public resources like computers and library access, adult education, and group savings and loans. To maintain cohesion and peace, SHOFCO extended its fellowship programs to supporting soccer teams, youth programs and women empowerment groups. “By linking community services with a school for girls, we show that girls and their education are part of an ecosystem of value, and we invite the whole community to participate. Placing schools for girls at the epicenter of our programming makes schools portals for large scale social change,” the organization notes in a statement. So far, SHOFCO has served over 180,000 people, of which 76,000 had benefited from its programs by 2015. Over 6,000 people are currently accessed to clean water from its kiosks daily at subsidized rates, and an equal number use their toilets each day. 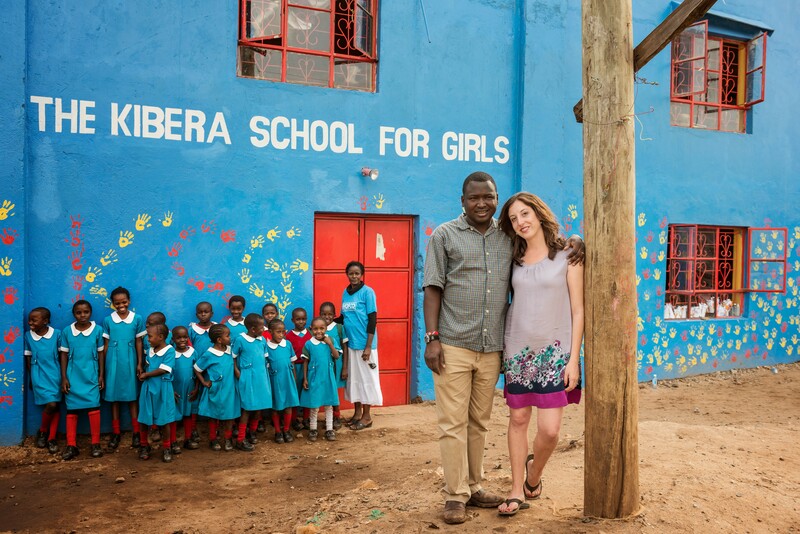 “We’re now working in four slums across Kenya, which has [extended] our reach to over 180,000 people directly this year,” Odede’s wife, Posner, told VOGUE magazine. About 64 per cent of Kibera community practice family planning as the clinic registers more patients daily for treatment, thanks to donor goodwill and donations. The clinic recently received handheld ultra-sound equipment from General Electric company under a $25,000 partnership, as well as training to its more than 20 nurses and clinical officers, as a way of increasing access to pre-natal screenings for expectant mothers in the slum. Even though the couple may be a signature success story now, painting hope on faces of hundreds of underprivileged families, it has taken decades of struggle, dedication, resilience and compassion to grow this largely-impacting organization. The founders recently released their New York best-selling memoir titled, Find Me Unafraid: Love, Loss, and Hope in an African Slum.